Mobile technology is in a constant state of change. Access and core networks have evolved enormously and transport networks have also developed hugely over the years. From PDH and then SDH signals, microwave transport became IP-ready to serve the needs of 3G/4G networks. 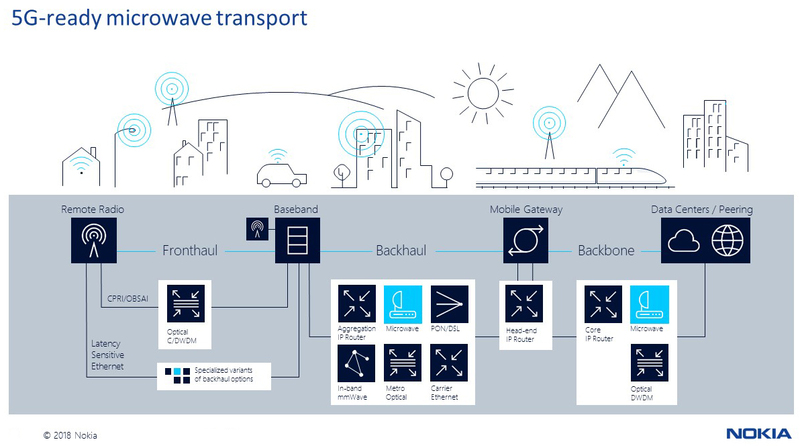 With 5G almost here, mobile transport is transforming again, from a collection of discrete, static network connections to an automated, end-to-end networking system, the “5G Anyhaul”. For microwave transport, the challenge is to build a system that offers the optimal combination of ultra-high speed, low latency connectivity, effective spectrum usage, easy installation, end-to-end network service management and of course, minimal operational cost. For the needs of future networks, these new microwaves should be fully 5G ready, providing multi-gigabit throughput and ultra-low latency together with end-to-end high capacity (even 10G) interfaces. Need easy deployment? Split-mount and full outdoor configurations should be supported with the same ultra-broadband transceivers, ensuring full integration with base stations and cell-site routers. The microwave platform should also support multi-frequency carrier aggregation (both microwave-millimeter wave, microwave-microwave) in order to allow operators to fully utilize their spectrum and resources. In addition with dual-band antennas and wideband transceivers they could also keep the number of units on site to a minimum and reduce the spare parts as well. Microwaves as part of the 5G Anyhaul network, should provide dynamic end-to-end service management with full SDN operation with open standard interfaces as well, producing an automated network for cloud-native network elements. Besides of all these, the next generation microwaves being part of the Anyhaul should provide similar features to IP devices. So that means Layer 3 Virtual Private Network (L3VPN) services should be also supported already on microwaves as well in order to create Virtual Private Routed Network (VPRN) on the microwave network segment. The challenge is complex but the evolution is essential for the next generation of mobile networks. We can be excited because this new wave of innovation in microwaves is here! With Wavence, the next generation of microwave is already achievable and is set to form an important part of future networks. At Mobile World Congress 2018, we will showcase our complete 5G ready microwave transport solution with our new ultra-broadband transceiver (UBT-S,) the full E2E 10G connectivity and the dual-band/wide band components. Visit our website to explore Nokia 5G Anyhaul and Wavence.